Of the 200 organizations that took part, there were 28 different learning management systems being used. 71% of respondents found engagement the most challenging part of delivering training. We focused on this problem, and the results were interesting. Those struggling most were not using simple tactics that are proven to help engagement. And many were using the same learning model for different types of training. In this article, we’ll explain the golden rules of learning engagement. These rules are inspired by the insights our Customer Success team have gained from helping our customers to overcome this challenging element of delivering training. Implementing these rules will positively impact your learners’ engagement with their training. Download our eBook, share it with your colleagues, and let us know your thoughts and experiences. If you like this content and want more, subscribe to our blog to get our posts straight to your inbox once a week. It's a willingness for the learner to interact consistently with the training provided in order to achieve a learning goal. This willingness relates to curiosity, interest, perceived value, and reward. A learner can be many people including employees, partners, or customers. The audience may change but the key principles generally hold true. We'll differentiate between two distinct types of training - mandatory and optional. And then view learner engagement in the context of both. Mandatory training has to be completed, usually to ensure compliance with legislation. It's that simple. The focus on engaging the learner throughout this type of training can often take a back seat. In comparison, optional training leans on a positive learning experience to encourage engagement. When it comes to delivering great training programs learner engagement doesn’t happen by chance. You’ll need resources, time and support. Without commitment from stakeholders, the steps that follow will fail. Why? The success of training is reliant on buy-in and support from your colleagues. The most effective way to get your colleagues on board is to explain the benefits. An engaged learner trains more often, and retains more information. Learners become autonomous, with fewer touch points required for them to complete courses. This changes the paradigm from a focus on chasing learners, to one where other factors drive them to complete training. It’s not just about easier management of training. Engagement positively impacts other business challenges like learner performance and retention. Commitment from stakeholders doesn’t have to be a hassle either. The key element is that they emphasize the importance of training to their teams. Encouraging your learners to prioritize training helps to reduce their resistance to it. Relying on colleagues to support training is the first step. The next is effective communication to the wider organization. Once you have 'buy-in' from colleagues, the first task is to get training introduced into regular channels of communication. 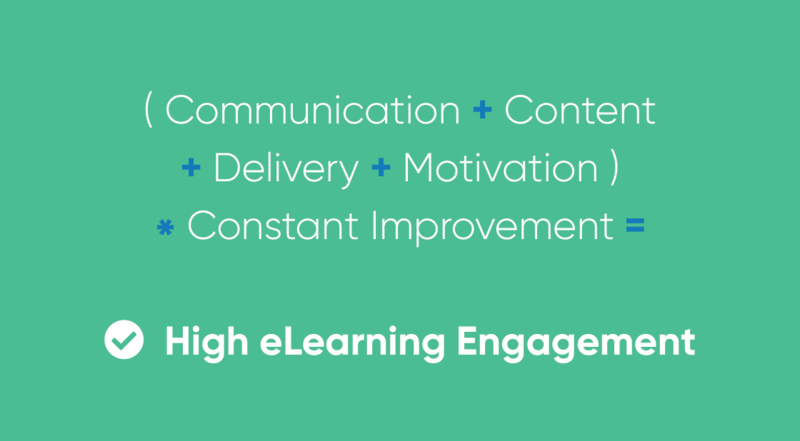 (Communication + Content + Delivery + Motivation)* Constant Improvement = High eLearning Engagement. Think about all of the different ways your organization communicates. What was the last message sent to a large group of learners and how was it shared? Why was that communication channel used? Was it through Slack, Yammer, Email, Trello? Training conversations should be just as likely to happen in the boardroom or by the water-cooler. From quarterly updates to weekly meetings, and daily stand-ups, get training on the agenda. Humans are creatures of habit. Regular conversations about training will help to solidify it as a priority. With regular communication, you can weave training programs into your company's culture. A consistent cadence is very important. The goal is for learners to describe training as “something we do” rather than “something we have to do”. As the saying, often attributed to Peter Drucker, goes: “Culture eats strategy for breakfast”. Your learning management system (LMS) should have the tools that you need to reinforce this. Notifications and reminders are simple features that keep training front of mind. But can you influence the process earlier than these LMS touch points? Go to the learner by contacting them via their most used communication channels. Timelines of when the training will be available, what training will be available, due dates, etc. Some of the information above may appear obvious. But it will help to reduce any friction that exists, particularly with learners who have never used an LMS before. It's also easy to forget that an LMS is just one tool within a larger set that your learners use day in and day out. Most LMSs are designed well and so are intuitive to use for the learner. Providing clear and concise information on training programs and the LMS helps. Your learners should know exactly what they need to do and when they need to do it. And you should explain how training helps them in their day-to-day performance and progression. Your learners may ask themselves ‘is this training worthy of my time?’. Your job is to ensure that the answer to this is a resounding 'Yes', even if the subject matter isn’t enthralling. The main reasons for carrying out training are usually quite obvious. Leading with that can place the task lower down on the learner's list of priorities. A learner that believes the lesson is valuable to them is more engaged and learns better. You have to show them the value. In the case of compliance courses, it's obvious that the training has to be done. But there’s an opportunity to package that message better. For example, a health and safety course has to be completed to comply with legislation and ultimately avoid potential penalties. The message communicated to learners is usually something along the lines of “You have to complete this course”. A better way to communicate this message is “this course will help you stay safe in your workplace”. Use the information you have at hand to detail the specific benefits. For example, people who completed this course are X% less likely to be injured than those who do not. All you need to do is align the message with each learner's priorities and motivations instead of the company’s. This approach is effective for other types of courses too. Let's take a sales training course, for example. The motivation to complete the course could be presented as “your manager wants you to pass this course” or “you will close more deals as a result of completing this training”. Which message do you think would be more likely to engage and motivate the sales team? Messaging takes practice to get right. If this is an area that you struggle with, buy your marketing manager a coffee and find out how they do it. As a trainer you’ll need to become adept at promoting the specific benefits training has for your learners. A campaign to promote the use of your LMS and the business’s training efforts as a whole. A campaign like this sits above promoting individual courses and learning paths. It serves as the foundation for all other training efforts and can be used to communicate with both current and future learners. This places the LMS as a central tool in their working life within your organization. A campaign to promote individual courses or training programs. The main purpose is to promote existing and upcoming courses to learners. It also reminds managers so that they can provide support to learners when they’re completing training and schedule additional resources if necessary. This campaign should detail the learning objectives for the course when it will be available, when it's due for completion, and specific details on the course content. The benefits for the learner and the skills they will develop should also be clearly communicated. With strong communication and promotion in place, let's move on to building and maintaining momentum. This is where you can incorporate positive reinforcement. Building a training centric culture in your organization requires a lot of encouragement. This encouragement promotes inclusion and also motivates learners to engage. Highlighting positive performance is key. This can be achieved by showcasing learners whose behavior is positively affecting the overall performance of your training programs. Your annual health and safety course may be in the ‘mandatory training’ category, but the process can always improve. Highlight those that have speedily passed the course, or have scored well. This uses those learners as a positive example for others to follow. Mentioning learners not only reinforces and promotes engagement. It humanizes the process. It also creates a sense of competition. We’re all wired to compete. In LearnUpon, we have a channel for communicating positive feedback from our customers. This rewards those who are the subject of the praise as it showcases team members who are living the values we have set out. Team members clearly see that great work is valued and appreciated. This creates a culture of encouragement. And this strategy when applied to training works just as well as it does with customer feedback. This is a soft approach to communicating the positive efforts of your learners. For a more robust and formalized view of training completion, check out the final section: Analysis and Iteration. Course design is a vast and complicated subject. If you want a deep dive into this subject check out our dedicated eBook: Culture, Content, LMS: Prepare for eLearning success. Let the content of the course and the situation of the learner dictate the design. Some subjects can be tackled in small chunks. Some need more detail. Always ask yourself, “will this structure suit the content?” Course content should be easily consumed. But don’t go too far. ‘Microlearning’ as it's called isn’t just about creating tiny, meaningless snippets. You should be laser-focused on the learning goal of each course or module so you can strategically build your course content around this goal. Use media types that are appropriate to the subject matter. Ask yourself, “how can we communicate this learning goal best?”. If you’re using images in your courses, use high-quality and relevant ones so they don’t distract your learners. Learners try sub-consciously to make a link between the image and the subject matter. If they can’t find that connection, a jarring effect is caused. That’s why it’s important not to use images just to fill up space. If you need to use stock images, try sites like Unsplash or Pexels for inspiration. If you don’t have access to Photoshop, sites like Croppola are a great way to crop your images to the exact measurements and aspect ratios you need. Considering cognitive overload again, ask yourself, “how much is too much text? What devices are being used to complete training? Will the learner be able to read and digest large chunks of text?” Each section of your course needs room to breathe. So make sure you think about the balance of text and media. If necessary, you can provide links to further resources for those learners who require more context. It's easier than ever to generate videos. It’s a rich media source. It provides high levels of information, context, and emphasis in a consumable format. Before you decide that you don’t have the required experience or resources to create video course content, do some research. There are accessible tools such as Camtasia, or SoapBox that make video recording quick and simple. Adding video to courses is a sure-fire way to get a better rate of engagement. Remember, there’s no category in the Oscars for high-quality eLearning video production. Get started by keeping your videos short, to the point, and leave the high-quality production values to the professionals. If the video is too long, you run the risk of encouraging the learner to be passive. Most modern LMSs allow you to drag and drop video files into courses so there’s no added complexity to the overall course building process. Sometimes a course topic is best explained in a live setting. Webinars allow you to do this easily, across geographically dispersed teams. A webinar has the benefits of a recreating classroom session, while also being cost effective and practical. It’s one of the most engaging ways to deliver training. Webinars also are a great way to reduce learner isolation, which is covered in more detail later. Choose a webinar tool that you’re comfortable with. Options include GoToWebinar, Cisco WebEx, Adobe Connect, Zoom and AnyMeeting. Google Hangouts is also an option, although you’ll be limited to ten participants. As an added bonus you can record the sessions and reuse this video content in future courses. Assessment is one of the most crucial aspects of delivering eLearning. Not only that, it’s a powerful tool for engagement. Creating well thought out exams, quizzes and assignments does two things. Make the exams interesting and fun where possible. Even if the exam is mandatory, the experience will stay with your learner and may hinder future, optional exams from being done. Now that we’ve dissected the learner experience, what’s next? Motivating learners to progress through, complete, and return to training. To implement this, we have to understand what actually motivates your learners. Once you create a spark of engagement, you need to maintain it. Over time the experience that a learner has will have an influence on their level of engagement. eLearning is like any other digital medium, it has to be easily consumed. That's why we need to focus on the user's experience. User Experience (UX) is a discipline most associated with software products. It’s how people feel when using a product, like an LMS. It should be frustration free and positive. Simplicity is key. So why is this so important for eLearning? The learner's first experience with the LMS and the courses dictates their future behavior. Frustration or difficulty reduces their likelihood of returning to training autonomously. That's why you need to focus on great delivery of course content. We live in a digital world that built for instant gratification. Your learners interact with software and social media products designed specifically around this construct. eLearning is no different. It should suit the lifestyles of your learners. A sense of empowerment comes from a learner being in control of when and where they complete their training. This boosts engagement and encourages regular use of the LMS. You can encourage this by allowing learners to enroll in more courses, return to completed ones and always have a hub of resources to refer to and use. Give them the ability to be heard by inviting feedback and suggestions so they become actively involved in improving training. Training should come from the most informed and reliable source. If a learner is a subject matter expert, bring them into the fold. The opportunity to be a guest trainer increases engagement, boosts morale and their connection with your business as a whole. It adds variation too, keeping things interesting. Poor course content reduces engagement, and poor user experience can destroy it. Whatever LMS you choose, make sure it’s easy for your learner to use. Especially when it comes to navigation. The user interface should create an illusion of familiarity. This is often described as an ‘intuitive design’ which really means the navigation of the software shouldn’t have to be explained to the end user in order to be usable. Make it easy for your new user also. Send information to all learners before they first log in. Include screenshots that walk them through the initial steps of logging in and accessing their training courses. This reduces any barriers to entry. And it reduces any unsureness on their part. Another simple step to creating a seamless learning experience is to brand the LMS with your organization’s colors and logos. This makes the system feel familiar to your learners and reduces the feeling of the LMS being another system they need to keep track of. It’s not an LMS, it’s your LMS. Invest in the learner’s convenience too by using Single Sign-on (SSO). This enables learners to access to the LMS without having to remember yet another set of login credentials. A little touch like this reaps big rewards in adoption and ongoing use. The primary goal is to remove any barriers that may dissuade your learners from successfully completing their training. If your LMS can launch courses from a notification email, turn that feature on! The path of least resistance leads to higher engagement. eLearning can happen anywhere so your learners can learn at any time. They may be on their daily commute, in a coffee shop or waiting to meet a client. And this found time is perfect for fitting training into their busy schedule. Make sure that the LMS is accessible from any device, at any time. Most LMSs have a responsive design to make this possible. Make sure that the design and composition of your course content complements the devices being used. Motivation exploits some fundamental principles of human psychology. First, let’s look at those principles. Then we’ll suggest the practical steps you can take to help motivate your learners to complete their training. There are two types of motivation at play in eLearning - intrinsic and extrinsic. They are both important drivers, each having a vital role to play. Intrinsic motivation is completing a task to obtain the primary benefit that will result. Not for any other consequence or benefit. It’s completing a course to gain the knowledge held within it. Extrinsic motivation is a secondary motivation. It’s the completing of a task for an external reward or recognition of doing so. So how does this impact your training efforts? We’ve already established that you should communicate the benefits of completing training to your learners. This is the intrinsic benefit. The motivation here is to complete the course for the knowledge that the learner will gain. If we’re honest with ourselves, extrinsic benefits are more likely to motivate. Without going down a rabbit-hole of pop psychology, we all love reward and recognition. Luckily, eLearning has a ready-made tool to introduce an extrinsic motivation into the mix; Gamification. Gamification is the use of game mechanics in activities such as eLearning to improve the user’s experience and motivate them to execute certain behaviors. Gamification is everywhere and used by everyone. Sometimes it's so subtle it goes unnoticed. You’re already using it, and so are your learners. Every time you get a stamp on a coffee shop loyalty card you’re engaging with the principles of gamification and being rewarded for it. The free coffee is like a carrot on the end of a stick. It increases your likelihood of regular engagement and loyalty with this coffee shop. The intrinsic motivation is that coffee is delicious. The extrinsic motivation is that we love seeing those stamps build up and getting rewarded when we’ve filled up the card. Do you have a fitness tracker on your wrist? That's a gamification machine right there! Going for a walk is often motivated by seeing that you haven’t reached your steps target for the day. Other great examples of gamification include Zombies, Run!, Foldit, and Chorewars. Badges: Awarded based on the completion of a task or activity, such as completing a course or a daily login. Points: Awarded to mark achievement and progress. The learner amasses points to reach a target. In this case, the target is usually called a level. Levels: Users climb levels set out for them. This motivates them to engage and complete more courses. Leaderboards: Progression and engagement are displayed on leaderboards. Comparison feeds into competition with others. Starting to use Gamification takes a more preparation than just turning on the feature in your LMS. And it shouldn’t be seen as a cover-up for poor course content. For it to be effective you need to treat it as a tool that enhances the learning experience alongside your great course content and great training delivery. With some thought, gamification is a powerful tool for increasing eLearning engagement. If it’s new to you, start off with a simple gamification strategy. Any strategy that works well starts off simple. And then becomes more complex as you familiarize yourself with what gamification tactics encourage your learners to engage. Begin with a simple set of badges for marquee courses. Use the stock ones provided in your LMS before dedicating time to creating custom ones. Get your game plan together. Ask yourself, "what will motivate my learners?" Points have to mean something. What happens when a learner gets to 100 points or 1,000 points. Will there be a reward? Will the learner be acknowledged for their efforts? Communicate the gamification rules to your learners. Make it as clear as possible so they know what to expect. It’s worth noting that gamification takes time. Think of our coffee loyalty card example. The extrinsic motivation only kicks in once you have a couple of stamps on your card. Let it run for a while before assessing its performance and how it’s impacting engagement. In an earlier section, we talked about the importance of communication. Follow this principle when introducing gamification elements. Get it on the agenda in stand-ups, huddles, or meetings. This breaks the ice, adds a level of fun to training and gives you a secondary spike in engagement. A great tactic is to use prizes for those who are engaging with gamification. Gamification activities also generate data that can be analyzed to assess learner engagement. We’ll focus on this later in the Analysis and Iteration section. eLearning has revolutionized the way in which we learn. It makes training programs more efficient and cost-effective. Having said that, one weakness you should be aware of is learner isolation. Let’s explain it and lay out the ways in which we can reduce it. Isolation from supporting users such as instructors or trainers. This involves a feeling that they’re not supported. Isolation from other learners. In this case, the learner may feel like they’re operating in a vacuum. You can take easy steps to avoid this which have the added benefit of reinforcing learner practices. To address these issues let's repackage some of the points we covered earlier. Clear communication of training programs and course content in more populated channels can help reduce this feeling of isolation. Piggyback on the pre-existing social channels that are frequently used by your learners. Train groups of learners together. These can be either classroom or webinar sessions. Adding these elements to eLearning introduces a blended learning model. Employ gamification features that focus the group. Leaderboards help to place the solo efforts of individual learners into the context of a group framework. These steps help to integrate learners into a ‘group’ and reduce the feeling of isolation. Social learning is a peer-to-peer interaction that heightens the understanding of training topics. By creating forums where learners share information, you introduce another layer to eLearning. learners can learn from each other and instructors can communicate easily with an entire audience. New topics can be suggested and introduced into training to improve their performance. Because of this, LMS providers have added fully threaded and moderated forums to their product. Discussion forums are very effective in increasing engagement in eLearning. To explain why we’ll return to some of the elements from previous sections. Communication: Having a dedicated communication channel allows the value of training to be explained and promoted. Cognitive overload: Information removed to prevent against cognitive overload can be provided to the learner in the forum setting. Those looking for more detail and context can seek it out here. Motivation: A forum is an environment to motivate learners through more traditional tactics. For example, by highlighting performance, etc.). It also provides learners an environment to share their own understanding or topics, further motivating them. Prevents against isolation: Isolation is reduced by adding this layer of communication and by facilitating collaboration. An eLearning forum creates a space for dialogue between learners, trainers, and instructors on training topics. learners get their questions answered in a public forum so they and others benefit from the answers. As learners raise questions and share their learning experiences they become more immersed in your learning ecosystem. Their feedback can also create action points for you to improve your training processes and content. The final stage in this process feeds into the last stage of our engagement formula. To constantly better your course content, delivery, and learner motivation, it’s vital to look back at training performance and identify areas to improve. Collect data on the training programs that you have delivered and keep a record of the motivation tactics you employed. Listening to your learners is the most important way to gauge levels of engagement. The best possible scenario is for you to have regular face to face access and communication with your learners where they speak candidly about the LMS, the courses, and their learning experiences We know that’s not always possible. Luckily, there are other ways for you to capture good, actionable data. Ask for feedback through the communication channels already in place, such as email or Slack. learners can use these to point out areas that positively and negatively impacted their experience. This is a great way to have real-time identification of successes and issues with training. Often this leads to quick fixes rather than long-term strategic improvements. You have to be able to measure the impact of your training efforts. That way you can demonstrate how it’s performing and identify areas for improvement. Note* the wording here is the wording we use at LearnUpon. If you use an LMS other than LearnUpon, the reports may be named something different. Active users are those who are logging into the LMS every month. If users are not logging in, they are not engaging. If this number is low, you need to act to increase it. 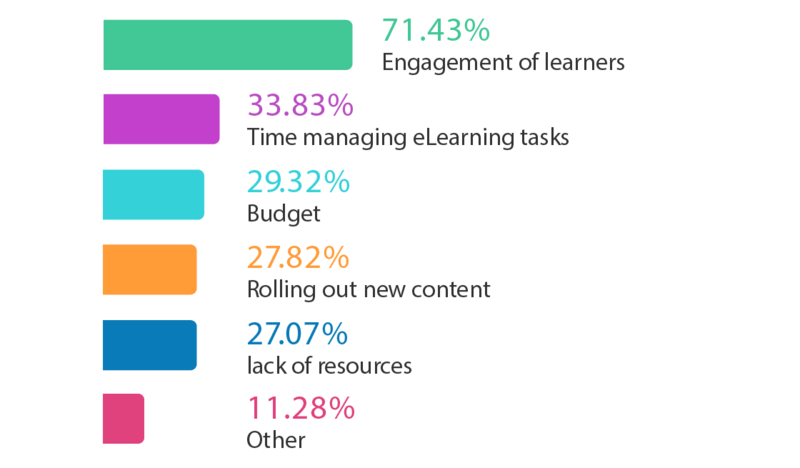 There are many factors for poor engagement with the LMS, but the main cause is often simply, out of sight, out of mind. We opened with Communication for good reason. Reminding your audience of the LMS, especially in the early days, is very important in getting users logged in and engaging with content. A course status report shows where learners are in their progress. It breaks down the status of all those enrolled in specific courses. It shows whether they have launched, are in progress, or finished. The beauty of this type of report is that it will show you bottlenecks in a course allowing you to dig deeper into the problem. Sometimes the problem is as simple as the objectives not being clear in a certain section. Time to complete a course is not always a reliable indicator of how engaging your course content is. Over time, and with higher numbers of courses, it does begin to have significance. Benchmark how long a course should take by timing yourself completing it and then compare that to the figure in your reports. The closer the two numbers are the better. Gamification gives you a lot of granular data to work with. You can get information on all the badges earned, points awarded and social sharing from your LMS reports. These can be transformed into graphs to map engagement over time. A lot of our customers provide their learners with gamification data for monthly updates. This also highlights times when engagement is low. Producing clear graphs showing how engagement is changing over time. More users, more comments, and more questions asked and answered all demonstrate higher engagement. When you’ve incorporated the suggestions we’ve covered, it's time for analysis. If you find your eLearning programs difficult to design or manage we suggest using a structured methodology. The ADDIE model is perfect. ADDIE is an acronym for the five stages of a process: Analysis, Design, Development, Implementation, and Evaluation. This model relies on each stage being completed in the given order but with a focus on reflection and iteration at each stage. It gives you a streamlined, focused approach that provides feedback for continuous improvement. The core of your training plan should be “How can we improve the situation and achieve business goals through training?”. You can use this question as the foundation for the rest of the process. This analysis feeds into your next training plan. It allows you to continuously enhance your efforts, with the intention of boosting learner engagement. You should come out with an evaluation report and actionable changes for your current or future courses. Once your training program and your analysis are complete, it’s time to communicate once again. This time the goal is to reinforce the efforts that have already been made, what you’ve achieved and use this to set future targets. Share the results of your analysis with two separate groups; Those involved in the management and rolling out of training, and the learners themselves. Sharing this data with your colleagues reinforces your organization’s commitment to nurturing a culture of learning for your learners. If the numbers are not where you need them to be, it’s a great way to outline the importance of an extra push the next time a training program is being run. Always focus on what you’ve achieved so far, no matter how small. By sharing this information with your learners, you are inviting them behind the curtain. Many will be empathetic with the difficulty faced by trainers and training managers. This promotes a more mindful approach and hopefully, more timely completion of their training. Sharing your successes are a great way to encourage their involvement too. There is no magic wand solution to increase your learner engagement with eLearning. It requires a thoughtful approach from the very start. Strategically plan and promote your training programs, remove the barriers to entry, motivate your learners, and strive to constantly improve. All of these efforts together should result in engaged learners who are ready and willing to learn.